to an otherwise quiet winter walk in the Maine woods. to remote spots with great views. 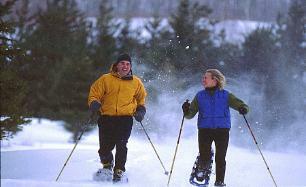 Here are just a few of Maine's scenic spots for winter exploration. at the top identifying the surrounding mountains and bodies of water. along the trails at Vaughan Woods in the small central Maine city of Hallowell. arched bridge at the midpoint.